REDE provides services at Johnson Space Center, Kennedy Space Center, the Environmental Protection Agency and CenterPoint Energy (Houston). Due to the work our staff has done on our contracts, and the work we have done with various agencies and mentoring other small business, REDE has been honored with several awards. June 16, 2014 - Successfully completed Stage III of OSHA Challenge. 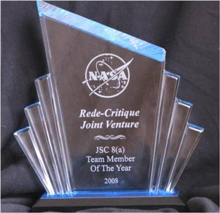 July 2011 – NASA JSC Space Flight Awareness Launch Honoree Award, 3 RCNSS employees recognized for their outstanding support to JSC. July 2011 – NASA JSC Secretary of Excellence Award, six employees were presented awards. March 2010 – Safety & Health Innovation Award – Honorable Mention (1st year these awards have been presented. In recognition of outstanding contribution and service to the nation by a small business in satisfying the needs of the Federal procurement system. April 2009 – Government Procurement Award – JSC 8(a) Team Member of the Year Award - GPC is a collaborative effort between the City of Houston, State of Texas, Houston Federal Executive Board, Port of Houston Authority, Metropolitan Transit Authority, Houston Minority Business Council, United Space Alliance, Women’s Business Enterprise Alliance and the Department of Veterans’ Affairs. June 2008 – REDE honored by having a plaque with the company logo flown on STS 124, crew also signed a company t-shirt. June 2008 – NASA JSC Contractor Safety Forum Excellence Award. Based upon company OSHA safety data, and participation and support activity level in the Contractor Affairs Safety Committee and the Contractor Safety Forum, and safety “best practices”. 2008 – Aggie Top 100 Award #18. Second year in a row for REDE to be recognized by the Aggie 100 for employing wisdom, and tenacity. REDE’s latest honor was given by the Small Business Administration when we were honored as an SBA 100 company. “SBA 100 features one hundred businesses that have created at least 100 jobs since receiving SBA assistance. The 100 companies are from across America and do business in a variety of industries, from manufacturing, to food and beverage, to shipping. 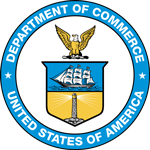 Each business received SBA support in the form of capital, contracting, counseling or investment before going on to create at least 100 jobs.” Click on the link below to go to the SBA website. http://www.sba.gov/sba-100/rede-inc REDE’s page on the website.